More excitement last week when my husband came back from his weekly golf game with a big smile on his face and a big shopping bag in his arms. Alice, wife of one of his golfing buddies, heard about my Hats For A Purpose project and made twenty-four hats for kids at risk. What an undertaking! 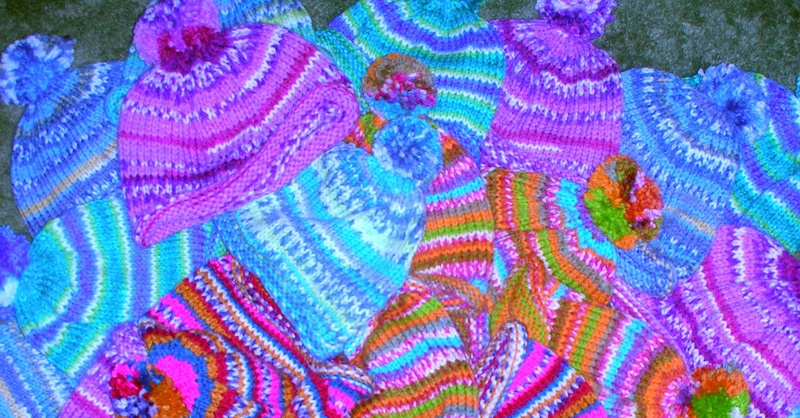 The hats are of every color, some with pompoms, some with cute little braids – each is another work of art created by someone with a loving and happy heart. Every time I look at all the hats I see, not just the hat itself, but the person who puts the time and energy into helping others. It pleases me that I know so many people who want to make a difference. Saw this today and thought of you. So glad to see that your hat collection is growing!